Vine leaves stuffed with rice and dill. With Greek olive oil. Ready to serve. No preservatives. Gluten & cholesterol free. Suitable for vegetarians. Great traditions, fine taste, to share! Glutten-free, non-GMO, No preservatites, No additives! Totally vegetarian and great for Lent! Meze is a small dish, hot or cold, served in the Mediterranean region with an aperitif or as a light meal. Meze complements and enhances the taste of the drink and provides the backdrop for a social gathering. Meze is more than just a dish; it is a sharable eating experience. Palirria combines a 50 years old cooking experience with the finest natural ingredietns and olive oil to prepare the most delicious meze dishes for you. 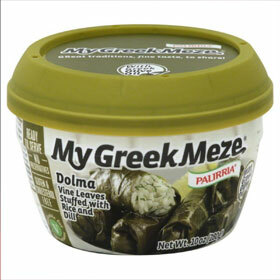 Dolma is the most famous Greek meze dish! Palirria is the No. 1 Dolma producer in the world. For more than half a century our people stuff and roll by hand tender vine leaves with nutritious rice, finely chopped onion, aromatic dill and olive oil using the traditional recipe - The result is a delicious dish that you can enjoy as a main course or share it with friends or family as an appetizer. You can savor this authentic Greek dish by adding on top freshly squeezed lemon or homemade egg lemon sauce or by combining it with Greek yoghurt!